Things change. Sometimes for better, and sometimes for worse. In this case, I don’t like the change happening around me, but I have to accept it and move on with life. Maybe I am being a drama queen, but when people change so much that you don’t see why you were drawn to them in the first place and the change isn’t good, there isn’t much point in keeping those people around. Change is difficult. I guess you can’t keep holding onto something that you can’t reach out and touch. Friendship is an intangible idea, but distance does play a role in the duration of some friendships. So what do I do next? Move on, make new friends. Spend time in the studio… create something new. Try to forget everything and find new people in life. I used to paint, but I haven’t for quite some time. This is a painting I did a couple of years ago (maybe 3) for my dad for Christmas. It was back in the day when I drew psychedelic shrooms and creepy crows and dark forests. Maybe that’s why this painting feels dark to me. I have been thinking about taking up painting again, just to see if I’ve still “got it”. Maybe I will paint another dark landscape or two, and then try a portrait like I used to paint. I only painted about 5 portraits in all, but all of them but one turned out decent… maybe painting will be a new direction to think in for the remainder of the summer. 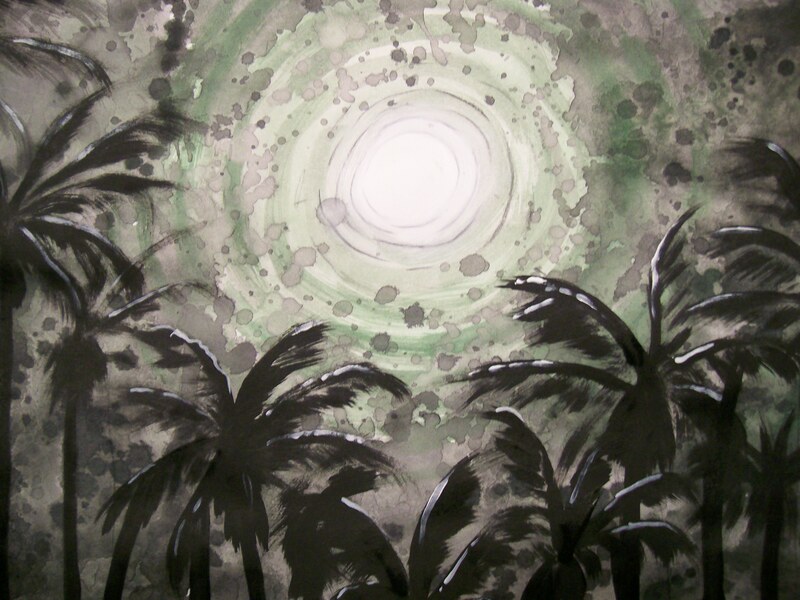 This entry was posted in Art, Ceramics, Creative Writing, Daydreaming, Deep Thought, Drawing, Nature, Painting, Philosophy, Sculpture, Uncategorized and tagged ceramics, change, dark landscape, forest, forgetting, friendship, love, moon, moving on, new directions, painting, palm trees, past, shrooms. Bookmark the permalink.